Emma Murray, Headteacher and Tara Welch, Assistant Headteacher Inclusion, at Seven Sisters Primary School discuss their rationale for mapping their in-school provision against the THRIVE Framework needs based groupings, incorporating the role of the Tavistock and Portman NHS Foundation Trust Children’s Wellbeing Practitioners based within the school. 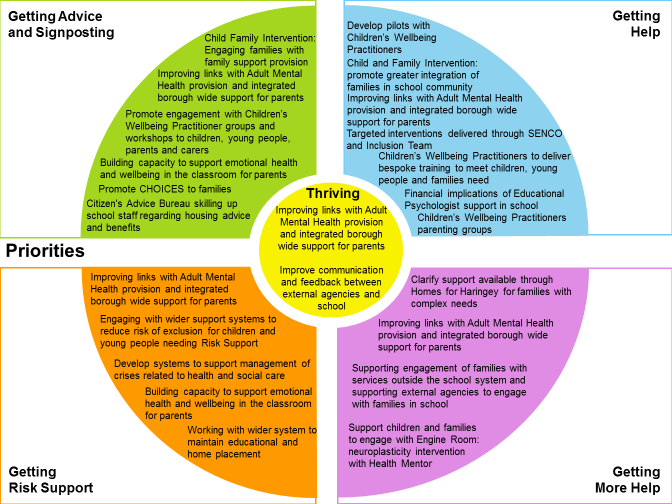 The London Borough of Haringey and NHS Haringey CCG are using transformation and pre-existing resources to develop integrated provision for children and young people’s mental health and wellbeing in line with the principles of the THRIVE Framework (Wolpert et al., 2016). Details on how this is being achieved can be found in their Local Transformation Plan. In addition, the London Borough of Haringey CAMHS Transformation Board were successful in being awarded funding from Health Education England for three Children’s Wellbeing Practitioners (CWPs) through the London CYP-IAPT Collaborative. Part of the Haringey CWP offer is to provide low intensity emotional health and wellbeing help and support for children, families and education staff within Seven Sisters Primary School. 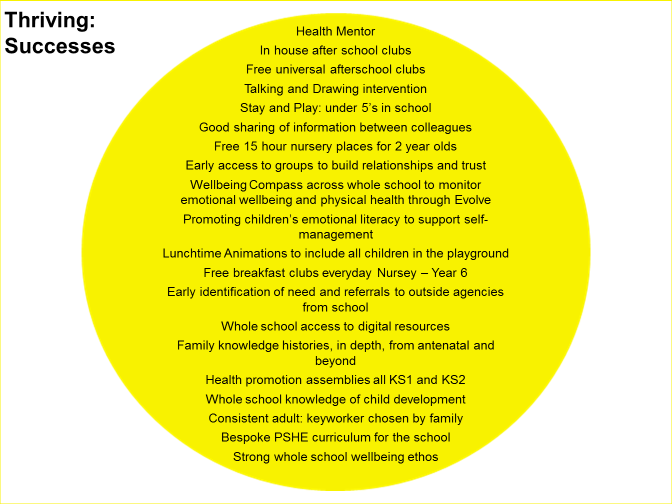 Emma Murray and Tara Welch were therefore interested in mapping their in-school offer against the THRIVE Framework needs based groupings to clarify the range of resources available to support the emotional health and wellbeing of children, young people and families attending Seven Sisters Primary School. In addition, they wanted to consider the role of CWPs within this whole school offer, potentially bridging the gap between the in-school offer, specialist Child and Adolescent Mental Health Services (CAMHS), and more holistic provision across the wider system within the London Borough of Haringey. An additional aim was to support shared decision making with the help and support available to children and their families, and to ensure timely and equitable access across the system. 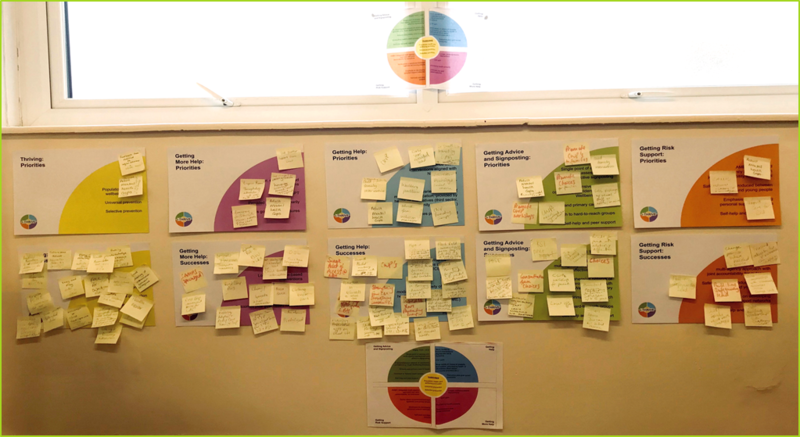 In November 2018, the i-THRIVE Programme Team facilitated a mapping workshop at the school to identify: successes, resources available, and priorities for taking forward for each of the THRIVE Framework needs based groupings. The workshop was attended by the pastoral team, staff with lead roles in supporting the emotional health and wellbeing of the children, young people and families attending the school and liaison with external services and agencies, the CWP service lead, and a representative from Haringey CHOICES, to provide clarity and additional insight into the external resources available in the locality. 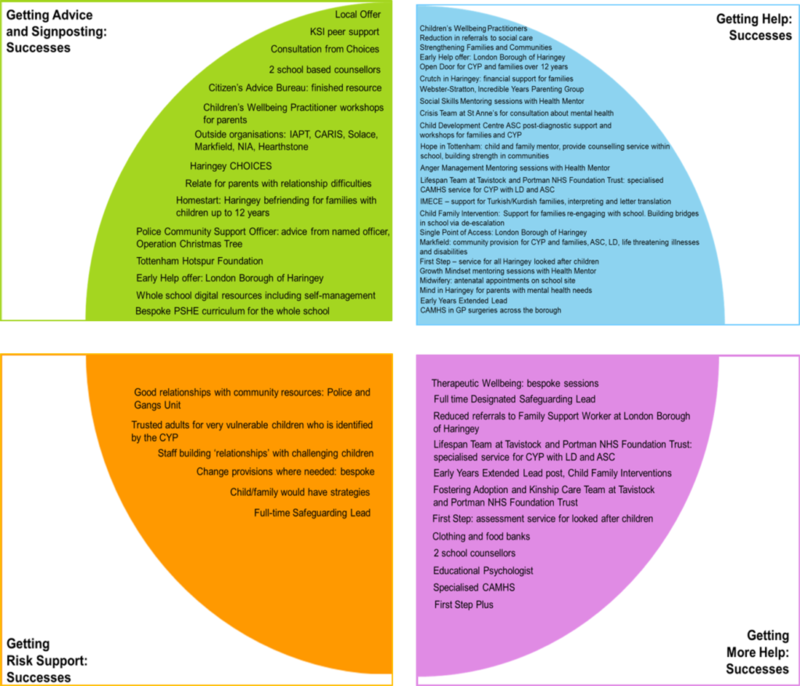 We increased staff knowledge on the holistic range of resources available to support emotional health and wellbeing, both within school and externally, alongside any gaps. Figure 1. Output from the THRIVE Framework needs based grouping mapping exercise. The output from the day was synthesised by the i-THRIVE Programme and shared with Seven Sisters Primary School to facilitate further discussions and to support the implementation of the THRIVE Framework. In one of the half-termly review meetings held to help identify the scope of Children’s Wellbeing Practitioner provision in the school community Emma, Tara, the CWP service lead and the i-THRIVE Programme team identified two pilot projects to deliver to support the emotional health and wellbeing of the children, young people and parents/carers at the school, and to build emotional health and wellbeing capacity within school staff. The Children’s Wellbeing Practitioners will run two groups over 6 weekly sessions; one targeted at parents/carers to help them support school readiness and manage challenging behaviour, and the other targeted at all Year 6 pupils to support them with anxiety management strategies in preparation for their upcoming SATs exams. It is anticipated that additional parent sessions will be provided to support the work within the children’s group. A Pastoral Team member will support the parent groups, and the Year 6 class teachers will support the anxiety groups, building their capacity to support children, young people and families beyond the groups and ensure strategies are embedded in the school. Due to the high number of different languages spoken by parents, flyers advertising the group will be translated into Turkish, Spanish and Portuguese by school staff from those communities, and where required, interpreters funded by Haringey CCG will support parent engagement within the groups. Parents or carers will meet with the CWPs facilitating the groups to identify their goals for the intervention. These goals will be reviewed after the intervention to identify whether they have been achieved, or whether further support from the wider system would be helpful. There will be a feedback loop between the CWPs and Tara to share progress and ensure any additional needs that arise through the groups are supported by the school. The CWP leads will provide a termly, whole school offer from nursery to Year 6 to promote emotionally friendly classrooms. Every teacher will have the opportunity to meet with the CWP leads for a session of up to an hour and half. These one to one sessions will build staff capacity by providing consultation and a professional space to support them in helping pupils. Where teachers identify children and/or parents or carers who would benefit from individual support the lead will build teacher capacity to signpost to appropriate support, including the Children’s Wellbeing Practitioners based within the school. Feedback will be collected from staff to evaluate the impact of these sessions, and the hope is this work will support the teacher’s capacity to help improve both pupil and staff emotional health and wellbeing. Progress from the pilots will be shared at the half-termly review meetings with a view to integrate social, emotional and mental health support across the school. Additional case studies will be created and shared on the pilot projects to disseminate learning. If you would like further information please contact Emma Murray at head@sevensisters.haringey.sch.uk or Tara Welch at twelch8.309@lgflmail.org. Edited by the i-THRIVE Programme Team.